Wowzers! I don't know that I have ever seen this big of a SUPER STEAL on backpacks. 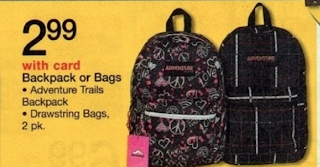 Starting this weekend, July 21st, you too can pick up a $2.99 backpack at Walgreens. I cannot believe that there are NO limits and NO coupons needed for this SUPER STEAL! Wow! For those of you that like to donate, you can pick these up and use as a donation item!